The Morality of Pluralism by John Kekes - Reviewer John Rowan. It cannot be denied that girls are high achievers at GCSE and A level. Girls’ Schools have consistently topped the league tables over recent years and the growing evidence of the success of Girls’ schools mean that more all girl schools have opened in the United States in the past ten years than in the previous 100. What this book seeks to do is in its own words support “high school girls in building confidence, self-esteem and self-respect.” As a secondary school teacher working with this age group these aims are paramount. Education is not just about sending young women out into the world with a handful of qualifications, but also with the wherewithal to succeed in a society which is constantly making demands on young people to make both moral and ethical judgements. Many of the issues in this book are important aspects of that training. Developing Emotional Literacy for Teenage Girls was designed originally for work with girls in a pupil referral unit. It consists of ten sessions ranging from ‘self-esteem and positive thinking’ to ‘being a parent’. The sessions are organised in sections headed: Introduction, icebreaker, talk time, activity sheets and plenary, which enable students to be both led from the front and to discuss the topics, either individually, in small groups, or as a whole class. Each chapter handles issues which are important for young people today. They cover subjects which will help them to establish boundaries and develop self confidence and self awareness. My main concern with this book was the wide range of topics covered which makes it unsuitable for any one year group: Year 7 are not quite ready to discuss parenthood whilst waiting until Year 11 to discuss self-esteem would be too late! The layout of the sessions provides ample scope for any teacher to develop good PHSE sessions, covering many teaching methods. With more pressure on teachers to use ICT in the classroom and the growing whiteboard technology available having a CD Rom of the worksheets can only be advantageous. The worksheets themselves are well laid out and easily photocopied. I personally trialled the introductory chapter with a new Year 7 class and found it a valuable opportunity to discuss group dynamics and establish a set of guidelines known as ‘Girl’s World Group Rules’ which we will use to encourage the form to work together as a team and take responsibility, not only for themselves, but for ensuring the well being of others in the class. However, as I have already commented it does not lend itself particularly to any one age group. The ‘level’ of the material also seems on occasion, to underestimate the intelligence of the girls for whom it is intended. Perhaps in the context of a referral unit where each session was designed to deal with particular students and their problems this resource would be extremely useful but in mainstream education it is more a case of pick and choose what is suitable. This excellent book, from Sage’s Brief Therapy Series, which focuses on brief and time limited therapies, will be of use and interest to anyone who wants to learn something – or something else – about this approach to working with people. Some of the main features of Solution-Focused Therapy include a focus on the here and now, clear, specific and attainable goals, achievable in the time available, establishing a good working relationship ASAP, the therapist being competent, hopeful and confident as well as active and openly influential. According to some research conducted in 1986 by Pekarik and Wierzbicki*, 65% of therapists preferred to deliver more than 15 sessions, but only 20% of clients expected it. 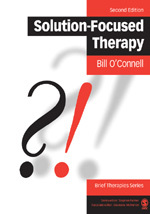 I do not know the current relationship between the clients’ expectations and the actual duration of the treatment, but I believe that the relationship between clients and therapists - and other professionals - will have changed for the better if they apply at least some of the principles and practices outline in O’Connell’s book. It is full of clearly explained, lucidly written and eminently practical advice, along with an overview of the Model. O’Connell offers good examples of techniques in practice and guidelines for each step of the process from the first session, the second session and beyond, keeping the Focus on Solutions and Solution-focused Supervision. Solution-Focused Therapists consult the client to find out how many sessions s/he thinks s/he might need. Some know while others are not so clear at first. Even after the first session the therapist might gently explore whether further sessions are necessary – without conveying the impression that the client’s problems are trivial or that further help is unavailable. This is one indication the pragmatic assumptions that underpin the SFT model, as is the idea that we do not have to understand a problem in order to solve it, or, people are resilient, creative problem-solvers. Aimed primarily at more or less experiences counsellors and therapists, chapter 10, Applying the Solution-focused Approach [SFA], explores creative adaptations of solution-focused ideas and practices in, for example, education, business, criminal justice, substance misuse, health and social services. Solution-Focused Therapy was influenced by the innovatory work of Milton Erikson, ‘the father of strategic therapy’, and is an elegant, highly respectful model of human behaviour supported by a creative approach to actualising human potential. A thoroughly enjoyable read about an inspiring approach to facilitating others without pathologising them, this book not only offers practical guidelines for beginners and validating supportive ideas for the more experienced, it could also inspire those who are simply interested in efficient and effective ways of empowering people via reminders of their potential to live zestful, creative, fruitful, connected lives. Resilience by Annie Greeff. 2 Volumes, Published by Crown House Publishing, July, 2005, 216 pages each. ISBN No. 1-904424376 and 1-904424543. Paperback. Price £19.99 each volume. It has been about twenty years since the concept of raising children’s self-esteem began to get a foothold in education. While it has to be recognised that much good work has been done toward this aim it is also apparent that just telling children they are great can at best be pointless and at worst, actually counter-productive. If they don’t believe it, they just won’t take it on board. And one can hardly blame some teachers for being just a tad cynical about heaping praise on kids who already seem to think they are the centre of the universe. That’s why these books are not just a superb resource; they move the whole personal development agenda up several notches. The basic premise of the book is that by teaching children skills, their self-esteem will go up. It seems common – sense and in retrospect it puzzles me why it seems such a novel concept. Basically, these two tomes are life management books which identify resilience as the foundation stone of successful living. 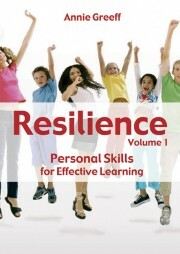 The resilience checklist in volume one specifically identifies those traits that mark out resilient people and sure enough, they tally closely with those stories we hear in assembly about the great and the good – persistence, coping with setbacks, enduring frustration – well, you know the list. 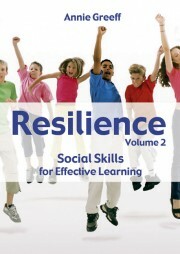 The books are well-structured with activities for individuals (‘on your own’) pairs, and group work. They teach how to raise awareness of one’s own emotions, and to observe closely other people – how, for example, their body language reveals their inner emotional state. From self-awareness, which includes recognition of our individual skills, talents and abilities, we move to self-management, conflict resolution and life – planning, including financial management. Each book is divided into six units; each of these has an overview, a list of outcomes, then a section of guidelines and activity sheets. As I said above, these are designed for individual, pair and group work and use a combination of awareness raising questionnaires, stories and role-plays. The individual units end with an action plan, sometimes a tick list, or a list of statements for each student to complete. These are very practical books, grounded in sound, research based theory. I am someone who works with young people growing up in adverse circumstances and I can vouch for the fact that they are already being fought over in our office. Well done Crown House for publishing yet another pioneering resource. I have been struggling with postmodernism for some time now. Attracted by its opposition to the tyranny of the one big truth which is true for everybody at all times, and which therefore must become oppressive sooner or later. Repelled by its empty relativism, which has no point of purchase to say that anything is better than anything else, and therefore leaves us floundering. Now here comes a book which gives me a way of avoiding the tyranny of the one big truth, and also the fragmentation of postmodernism. This is a proper book of philosophy, not one of those half-hearted efforts like the recent (I won’t quote the name) book, which was praised in all the Sunday papers and weekend reviews. It says that there are three basic attitudes to morality: monism (the one big truth or the one big ordering of truth); relativism (the proliferation of many little truths, each good in some area or other); and pluralism, where we allow for more than one truth, but want to know precisely how the various truths relate and make sense in relation to one another. Monism is so oppressive because it has just one answer to everything. My own position, on the other hand, is that questions are OK, answers are not. There is of course a paradox here - how can there be questions without answers? The way out of this is to see that there is nothing wrong with answers plural - what is death is THE answer singular. When we have THE answer, we feel powerful. If knowledge is power, it comes most often in the form of answers. There is a twist which can make this even more dangerous. If we believe we have found the person or organization which has the answer, we can devote ourselves to it. We can become a true believer. Hoffer's whole book is a warning against people who have found THE answer. When answers turn into certainties - then we all die. Recent events seem to bear this out. We have interposed a fact-proof screen between us and reality. As soon as you settle with a finality, you have ceased to live. This is exactly the warning of pluralism, as outlined by Kekes, in relation to monism. But we also need to guard against relativism. How does Kekes pull this off? He outlines six theses of pluralism. First there is the distinction between primary and secondary values. Primary values are universally human, and may be physiological, psychological or social. Secondary values vary with persons, societies, traditions and historical periods. Monists think that there must be one highest value, and that in cases of conflict this overriding value must settle the matter. Pluralists understand that all values are conditional. The second thesis is that conflict between values is unavoidable. This is partly because some values are incompatible - that is, they cannot all be realised at the same time - and partly because values can be incommensurable. The basic idea of incommensurability is that there are some things so unlike as to exclude any reasonable comparison among them. "Square roots and insults, smells and canasta, migrating birds and X-rays seem to exclude any common yardstick by which we could evaluate their respective merits or demerits." (p.21) This is a good reason for rejecting monism, because monism has to assume that values may be incompatible, but can never be incommensurable. The third thesis is that conflict-resolution is possible and desirable. Because we live in a shared culture, our conceptions of the good life or the importance of the traditional system of values to which we adhere will be wider and more general than the particular points in dispute. We can reflect on what would be best not only here and now but in the long run, given the values of our tradition or our conception of a good life. And Kekes points out that this not only refers to conflicts between people or groups of people, but also to conflicts within ourselves. We too can refer back to our more general conceptions of a good life or of our traditions. "And this fact about us provides both a common ground on which which we, who may be the factions of our divided selves, can agree to stand and a device for resolving our conflicts." (p.25) I think it is a pity that Kekes has never read Mary Parker Follett (Graham 1995), who teaches us so much about the integration of different points of view in conflicts of all kinds. He never goes beyond balance and compromise, and appears not to see that integration - where both parties to a dispute get all that they really want - is a better possibility. I wish Kekes had said more about the question of truth. With pluralism, we still want to know the difference between truth and falsehood. We still need to seek for more truth and deeper truths. But when we find them, we modestly say that we have found a truth, not the truth, and that makes all the difference. Even when we utter a truth, it matters very much who utters it, and in what context, and what ground we are standing on when we utter it. I think Kekes would agree with this, but he doesn't actually say so. The fourth thesis is that by the expansion of our possibilities and the imaginative exploration of them we can obtain a moral space which can be described as freedom. To lead a good life we need a rich supply of possibilities, a sufficiently developed imagination to enable us to explore them, and the enlargement of our freedom. "For the more numerous are the available possibilities and the better we appreciate the nature of these possibilities as possibilities we may try to realise, the greater will be our freedom to make for ourselves what seem to us like good lives." (p.28) This is the respect for human potential which seems to me very important. The fifth thesis is the need for limits. Kekes here introduces the notion of deep conventions, as distinguished from variable conventions. "Deep conventions protect the minimum requirements of all good lives, however they are conceived. Variable conventions also protect the requirements of good lives, but these requirements vary with traditions and conceptions of a good life." (p.31) Deep conventions have a context-independent justification, and this is what relativists cannot admit. The sixth thesis is that there can be such a thing as moral progress. This again distinguishes pluralism from relativism, as Kekes well argues. Given these basic theses, the author goes on to expand on each of them: a chapter each on the plurality and conditionality of values, the unavoidability of conflicts, the nature of reasonable conflict-resolution (an important discussion here of commitments, which may be basic, conditional or loose), the possibilities of life, the need for limits and the prospects of moral progress. "For individuals, moral progress is toward recognizing richer possibilities, growing in their imaginative appreciation of them, and increasing their freedom. For traditions, moral progress is toward creating a context in which individuals are encouraged rather than hindered in their aspiration to make a good life for themselves." (p.141) There is a good discussion here of the difference between propriety-shame, honour-shame and worth-shame. We then get a discussion of the limits to morality: of how non-moral values are important too and need to be taken into consideration, sometimes even taking precedence over moral values. The final chapter moves on to the political scene, and contrasts pluralism with liberalism, with which it may sometimes be confused. This again is very thorough. So what emerges from all this? For me it is a very satisfying answer to the problems which postmodernism raises. It manages to reconcile my desire to be able to hold two ideas in my head at the same time with my desire to avoid the directionlessness of relativism. The secret is to take nothing absolutely for granted. If we do that, we can hold on to whatever we may feel we need to hold on to, but in a provisional and friendly way, not an a fierce and compulsive way. It is the compulsion and the fierceness which make belief systems into killers, as we have been reminded very forcibly in recent weeks. If we wear our belief systems lightly, we can be free to entertain possibilities for long enough to explore them properly. Kekes in this book gives us the philosophical foundation to make this possible. Caroline Jenner has been teaching in state and independent schools for the past 23 years, of which the last 18 have been devoted to teaching English and Drama at Bromley High School for Girls in Kent. Mark Edwards was a head teacher, who still teaches part-time but combines this with writing articles, educational consultancy and entertaining people who like to hear badly performed rock, pop and music hall classics. John Rowan is a Fellow of the British Psychological Society, a qualified individual and group psychotherapist, a chartered counselling psychologist and an accredited counsellor. He is a Fellow of the BACP. The author of a number of books and co-editor of Innovative Therapy in Britain (Open University Press 1988) with Windy Dryden, and The plural self: Multiplicity in everyday life with Mick Cooper (Sage 1999), he has also provided chapters in many other books on psychotherapy. He has had six books of poetry published.